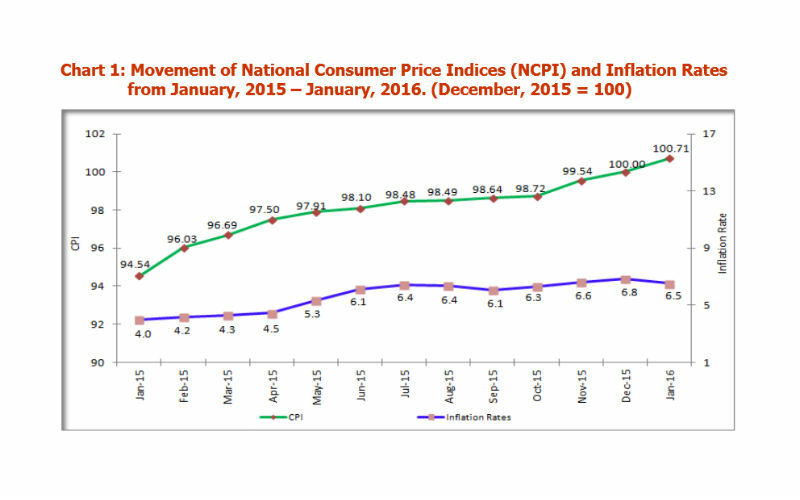 According to The National Bureau of Statistics of Tanzania (NBS) the Annual Headline Inflation Rate for the month of January 2016 decreased to 6.5% from 6.8% in December, 2015. The National Consumer Price Index (NCPI) which measures the change over time in the cost of a fixed basket of 278 goods and services purchased by a representative sample of households in Tanzania on monthly basis, increased from 94.54 in Jan, 2015 to 100.71 in Jan, 2016. According to the NBS, the weight given to food and non-alcoholic beverages in the basket of 278 goods, has been reduced from 47.8% in Dec, 2015, to 38.5% in Jan, 2016, to provide a more stable inflation rate figure for policy makers. Food and Non Alcoholic Beverages Inflation Rate for the Month of Jan 2016 has decreased to 10.7% from 11.1% recorded in Dec, 2015. The 12 months index change for non-food products for the month of Jan, 2016 has increased to 2.0% from 1.8% recorded in Dec, 2015. The Annual Inflation Rate which excludes food and energy for the month of Jan, 2016 has stagnated at 2.4% as it was recorded in Dec, 2015. According to Tanzania’s Finance and Planning Minister Philip Mpango, the country’s inflation is expected to remain at a single digit and to fall to 6.0% by June, 2016 and to oscillate between 5.0% and 8.0% in the mid-term.